Tripod Crest reconstructed the pavement along the 9km section of the A338 dual carriageway in Bournemouth. Tripod Crest was appointed at the early contractor involvement stage to help develop an integrated construction programme for the reconstruction of the pavement along a 9km section of the A338 dual carriageway in Bournemouth. 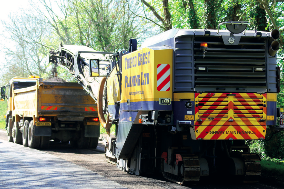 Tripod Crest provided the planing service that generated over 70,000 tonnes of asphalt planings which were recycled by Hanson to manufacture a foamix pavement. Our planing works were completed in four separate phases, where the speed of planing works was a key driver in the efficiency of the cycle to reconstruct the pavement. The works were completed on time and safely to the required standard.